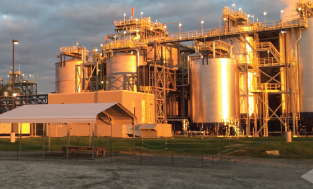 Global chemical company Huntsman has started up its new colour pigments facility in Augusta, Georgia. Huntsman says it invested more than US$172 million in the development of the new production plant, the first of its kind to be built in North America for more than 35 years. The new site has the capacity to produce 30,000 tonnes/year of yellow, red and black iron oxide pigments. The new facility will serve as the North American hub for Huntsman’s global pigments and additives business, which employs more than 4,500 people worldwide. Featuring a high level of automation in process operations and in packaging, the plant represents a step change in iron oxide manufacturing. With sustainability high on its corporate agenda, Huntsman says the site’s raw material supply chain has been closely integrated with its wider pigments and additives business. This enables the business to use iron sources obtained from waste streams at other plants as inputs at Augusta. Careful infrastructure and asset planning has also eliminated a drying step that is normally present at a stand-alone pigments production plant. Third party organisations involved in the development of Huntsman’s new colour pigments plant included the City of Augusta; Richmond Economic Development Authority; Georgia Department of Economic Development; Georgia Environmental Protection Division; Augusta Utility Department; Georgia Department of Transportation; Georgia Department of Labor; Georgia QuickStart; and Augusta Technical College. The firm has recruited more than 100 people to work at its new pigments plant. Meanwhile, with its German plant as the backbone of pigment business with 90 years experience, German chemicals firm Lanxess has opened a new site in Ningbo, China. It is operated by the Inorganic Pigments (IPG) business unit, which is the world’s largest producer of iron oxide pigments and has production sites on five continents. The firm says its facility is a model of sustainability with innovative ‘clean’ production technology; 200 new jobs have also been created. Mechanical completion was achieved end of 2015 and production came on stream since early 2016. 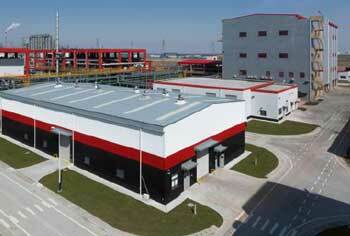 With Lanxess’s Ningbo plant, its total output worldwide is 375,000 tonnes/year. In terms of sustainable production, Lanxess says it applies the so-called patented Ningbo process, which is said to be a breakthrough in iron oxide red technology. It avoids harmful emissions by process optimisation; recycles by-products to save raw materials and undertakes catalytic decomposition of waste gases. Other criteria are: reduced demand for process water; efficient water purification to remove ammonium nitrate and re-use of purified waste water in the process (internal recycling). It also recovers energy by applying heat exchangers. Lanxess says the new Ningbo facility enables it to further extend what is already the broadest range of red iron oxides in the market.